Video from Show Us Some Love, UIC! 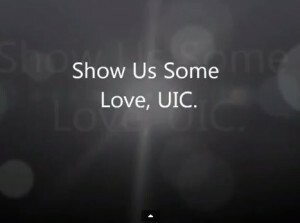 Check out our video from the wildly successful “Show Us Some Love, UIC” Valentine’s Day event! Available on our Facebook page (facebook.com/uicgeo) or YouTube http://youtu.be/311y3KrVExI )! Chicago—The Graduate Employees’ Organization, a labor union representing graduate student employees at UIC, has been without a contract for the past six months. This has resulted in a wage freeze for their approximately 1,500 members. The primary points of contention include high healthcare premiums, low wages, and increasing fees. Graduate employees have demanded that their compensation match UIC’s own figure of the annual cost of living, $17,958, and the administration’s proposals have thus far fallen more than three thousand dollars below this figure. At noon on Valentine’s Day, graduate employees will be urging the administration to not break their hearts, as they deliver hundreds of Valentine’s Day messages to the chancellor in the effort to get the Administration to be more reasonable at the bargaining table. “UIC calls itself a world class university. But when it comes to employee compensation, benefits, and working conditions, UIC is anything but world class,” says Kevin Carey, a PhD candidate in the department of English. Grad employees find it particularly egregious that UIC has dramatically increased the salaries of many administrators already receiving very high salaries. UIC’s chancellor, for example, received a 10% raise this year, bringing her salary to $411,752.11 while grad employees receive wages well below the cost of living for Chicago and often pay thousands of dollars in fees each semester. “UIC is a public university, and education should be its primary aim. This does not square well with the fact that those working in classrooms are receiving less than a living wage while administrative staff are drawing exorbitant salaries. 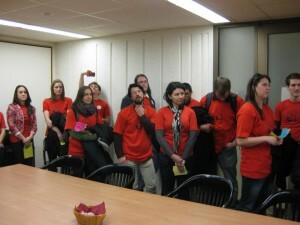 UIC’s priorities are backwards,” says Greg Sutliff, a teaching assistant in the Philosophy department.